The Audi Q5 has been unveiled and it’s a great SUV. For those who believed the bestselling Audi Q5 SUV could not be improved, the carmaker has unveiled an all-new model with better ride and handling dynamics at the Paris motor show. It’s also lighter by 90 kg than the current model with more boot space as well. There’s also more space on board for passengers of the Audi Q5 with a larger interior and headroom space as well as more room for those sat in the rear. Audi have also developed a five link suspension system to deliver better levels of grip and handling with the optional adaptive air suspension system smoothing out bumpy roads. The new Audi Q5 is available with a choice of two diesels, and one petrol engine which have more power added. Audi says they’ve reworked everything from the ground-up and boosted driver assistance and connectivity levels. There are also better driving dynamics and less road noise in the Audi Q5’s cabin and it’s also a great place to spend time in. Among the innovations is a new Quattro drive system, a damper control for the air suspension and a comprehensive line-up of assistance and infotainment systems. These include, as drivers will find in the A4 and Q7, a self-learning ‘personal route assist’ function where the Q5’s satnav system learns the destinations and routes that are regularly selected by the driver and will use the driver’s behaviour to deliver an optimised route. The new infotainment system connects smart phones to the car’s aerial to boost reception quality and will charge the phone at the same time. There’s a top end sound system and the Audi tablet which is a flexible entertainment device. Of the driver safety and assistance systems, there is the intelligent interplay which is Audi’s step towards piloted driving with three assistance packages available including parking, parking advanced and tour. The aim is to boost fuel efficiency by utilising the car’s surroundings and using adaptive cruise control to handle some of the steering work when traffic is slow-moving. However, Audi is also unveiling a new 2.0 litre TDI engine which produces 190 bhp with lower running costs than the engine it replaces and soon after its official launch there will be a 2.0 litre TFSI unit available as well which will return around 42 mpg and has emissions of 154g/km. Drivers also have a new 3.0 litre TDI producing 286 bhp to choose at some point next year. 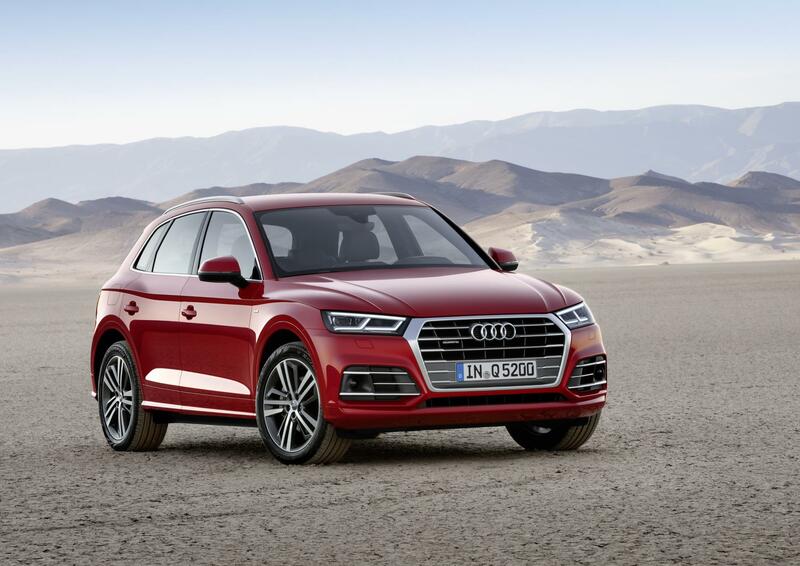 The new Audi Q5 is available to order later this year with deliveries starting in spring 2017. This entry was posted in Car Leasing, Cars, Crossover Cars, New Cars and tagged audi q5 by Steve Lumley. Bookmark the permalink.